If you’ve seen any trailers for the new movie Nanny McPhee Returns, you know it has something to do with unruly children, a magical nanny, and swimming piglets. But it really has much more to it. The film is set up by depicting three misbehaved farm children who are being raised by their mother, Isabel Green, while their father is away fighting in World War II. The children are dirty and always fighting, but Mrs. Green hardly has any time to discipline them because she is working, keeping up the farm, and trying to avoid her husband’s sleazy brother who wants her consent to sell their home. The story begins with the Green family preparing for their mother’s niece and nephew to come stay with them from London. They are trying to clean up the house and the farm to accommodate these refined children. Of course, nothing seems to go right. The owner at the shop Isabel works at, Mrs. Docherty, is losing her memory and misplacing all the goods, the cousins come a day early and are terribly rude, and Uncle Phil’s ulterior motive for trying to sell the farm is to pay off his gambling debts. Just in time, Nanny McPhee shows up to save the day. The casting is near perfect; with Emma Thompson being her lovely, but firm, self as Nanny McPhee, Maggie Gyllenhall is wonderful as the exasperated Mrs. Green; and Maggie Smith delightful as the slightly kooky Mrs. Docherty. The children actors are all quite capable, with Rosie Taylor-Ritson playing up the comedy best, as cousin Celia. Rhys Ifans is a bit over the top as Uncle Phil, but it works in a movie with so much magic anyway. The film also includes fine cameos by Ralph Fiennes and Ewan McGregor. It seems as if the filmmakers have discovered CG (character generation) animation since the first Nanny McPhee, and have slightly overused it. Some are done very well, like the synchronized swimming pigs for instance (Thompson’s own favorite scene in the film). At other times though, it is a bit exhausting. The movie is also extremely touching, in the way that Mrs. Green loves her children so much, she will do anything to provide for them, including sacrificing time with her brood to work and keep the farm going until their father has returned. The film also touches on some darker themes that children today can relate to, like growing up during wartime, foreclosure, gambling, loss of a parent, divorce, and dementia. But every bad thing is counteracted by something good, and all the children learn how to solve problems themselves, which is quite empowering for the younger audience members. All in all, it is quite a charming movie, with enough poop jokes to make the kids laugh (and maybe the adults) and stay interested. You shouldn’t worry about that though, it might be hard to drag them out of the theater when it’s over! 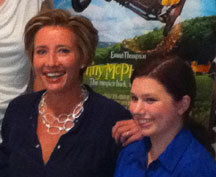 Review contributed by Hayley Watkins, a high school sophomore, who had the opportunity to meet and interview Emma Thompson during her New York publicity tour. Relativity Media’s Rogue and AMC Theatres® announce today the launch of the “Big Break Movie Contest,” which will provide filmmakers with previously undistributed feature-length films the opportunity to obtain exclusive on-screen distribution. Submissions will be accepted Aug. 16 through Oct. 15, 2010. Five finalists will be selected, professional trailers will be created for them by the Rogue team and debuted online at iamrogue.com where the general public can vote. The winning film will be released across the country in 50 AMC theatres for at least one week as part of the AMC independent (AMCi) program. 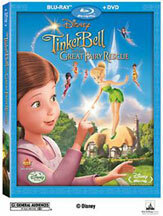 The winning movie will be announced Dec 20, 2010 and will tentatively be released in spring 2011. The esteemed panel of judges includes actress Kate Bosworth, Relativity’s CEO Ryan Kavanaugh, AMC Theatres’ Vice President of Specialty and Alternative Content Nikkole Denson-Randolph, Relativity President of Worldwide Production Tucker Tooley, iamrogue.com’s Editor-In-Chief Jimmy O, and Youtube’s “Beyond the Trailer” creator, Grace Randolph. The contest will be hosted at iamrogue.com/bigbreak. Contestants must first submit a DVD with the finished film and a short trailer, or a 2-minute excerpt from the film. Filmmakers should then visit iamrogue.com beginning Aug. 16 to create a User Profile and upload trailers or excerpts. Rogue will support the finalists with further editing and production, creating a professional trailer, as well as handling the marketing and logistics of the release for the winning title. GO to iamrogue.com from August 16, create a USER PROFILE and UPLOAD your trailer or excerpt from your movie. 5 finalists will be chosen. Relativity’s team will create professional trailers for each finalist. . These will be posted online at iamrogue.com/big break for movie fans to review and give comments. The judges will announce the winner on December 20, with release occurring sometime in spring 2011. Twelve children have been selected as winners of the national PBS KIDS GO! Writers Contest, an initiative designed to promote the advancement of reading skills by encouraging children to develop original stories and illustrations. The winning entries (first, second and third place from grades K-3) for the national-local Contest were chosen from over 25,000 submissions from across the country by a panel of America’s foremost children’s authors, illustrators and content experts including Ann M. Martin, author of The Baby-sitters Club® series; R.L. Stine, author of the Goosebumps® series; Marc Brown, creator of Arthur; Tony DiTerlizzi, creator of The Spiderwick Chronicles; and Lisa Henson, CEO of The Jim Henson Company, among others. A complete list of the honorary judges can be viewed here . The winning stories can be found on the Contest website, located on ReadyToLearnReading.org, along with audio recordings of beloved PBS KIDS GO! characters from MARTHA SPEAKS, WORD GIRL, and THE ELECTRIC COMPANY reading the winning entries aloud. The website also features interactive writing activities as well as a special message from singer-songwriter and American Idol winner Jordin Sparks about the influence of writing in her life. “We are proud that through our partnership with PBS KIDS GO! and PBS stations around the country, we are able to celebrate the success of all of the Contest winners and participants as they explore the importance of literacy and creativity,” said WNED President and CEO Donald K. Boswell. The PBS KIDS GO! Writers Contest is a part of PBS KIDS Raising Readers, a national initiative which uses the power of public media to build the reading skills of children ages two to eight, with an emphasis on children from low-income families. The effort is funded by a Ready To Learn grant from the U.S. Department of Education, part of a cooperative agreement with the Corporation for Public Broadcasting (CPB), PBS and The Ready To Learn Partnership. Eloise Goes to School. After Eloise’s tutor Philip quits, Nanny enrolls her in the prestigious Hawthorne Academy. 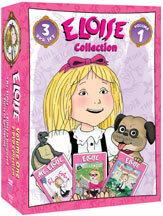 Eloise can’t wait to begin real school, but soon finds out it isn’t exactly what she was expecting. There are mean girls on the playground, very strict teachers and so many rules rules rules! Eloise decides it’s time to make school fun again. She’s teaching her new friends to stand up to bullies, helping her teacher understand there are a lot of different ways to learn and having tons of adventures. Can Eloise fit in at her new school? Will she be able to follow all the rules while remaining true to herself? Imagination runs wild and being bored is never allowed in this fun-filled animated adventure featuring the talented voices of Lynn Redgrave, Tim Curry, Neil Patrick Harris and Doris Roberts! DVD. 45 min. ; $14.98; Ages 2-5. Anchor Bay Entertainment. Wow! Wow! Wubbzy! 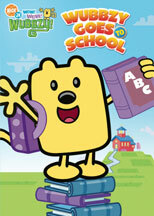 : Wubbzy Goes to School. Watch as Wubbzy faces his fear of going to school, Widget trains to be a ballerina and everybody tries to learn tricks from Moo Moo The Magician. Join the fun as Wubbzy and his friends meet new kids and discover new experiences, with plenty of singing and dancing along the way! DVD. 70 min. ; $13.98; Ages 2-5. Anchor Bay Entertainment. ARRIVE EARLY. Theatre is overbooked to ensure capacity. Seating is on a first com, first seated basis. PRINT OUT THE TICKET. No one will be admitted without a ticket or after the screening begins. 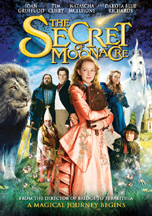 SYNOPSIS: After being orphaned, young Maria Merryweather (Dakota Blue Richards must leave her luxurious home and live with her eccentric uncle Sir Benjamin (Ioan Gruffudd) at the mysterious Moonacre Manor. There, she discovers a magical moonlit world torn apart by an ancient feud and inhabited by outlandish characters and mythical beasts. Now, Maria must unearth the secrets of her past in order to fulfill her destiny… all before the 5000th moon rises and Moonacre Manor disappears into the sea forever. For more details and a discussion guide, go here. You are currently browsing the Granny Ranny's Coming Attractions weblog archives for August, 2010.